There are 8 sets of god cards in the game – each is a different colour and represents a specific god. Whilst the cards within each set have lots of variety, the abilities of each set of god cards have a common theme; for example, one god’s cards are about affecting other players, etc. Each game is played with 5 of the 8 sets, so this will give variety in replay, especially as 2 of the sets add extra rules too. Also, as well as the set (god/colour) it belongs to, each god card has the number 1, 2, or 3 on it too. The majority of VPs usually come from sets of god cards in your Elysium – either sets of the same colour but different number, or same number but different colour. There are all sorts of abilities on the cards to sue and combine, but there are two key mechanics to highlight. The first is how players gain cards: At the start of every round, each player starts with 4 coloured columns (red, blue, green and yellow). On your turn, you can claim any one of the remaining cards, or turn order tokens, if you currently hold the coloured markers that match those shown on the card, i.e. 1 yellow marker, or 1 green plus 1 blue, etc. After claiming a card, or turn order marker, you must discard any one of your remaining coloured markers, not necessarily those used to claim it – so you could use your blue marker to claim a card but discard your red marker. If you can’t claim a card, you get a face-down card off the deck called a citizen who has no ability but can be used as a wild card in your Elysium to make sets (although at the cost of 2VPs). 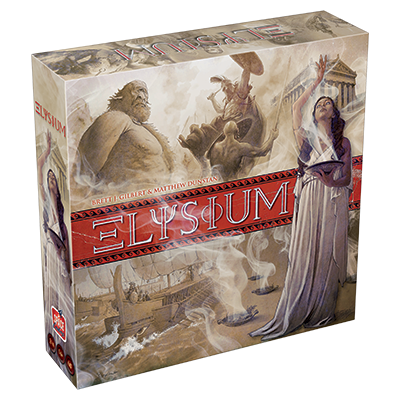 The second large game mechanic to mention is how cards get moved into your Elysium. At the end of reach round, players receive some VPs, cash and transfers based on which turn order marker they have chosen. 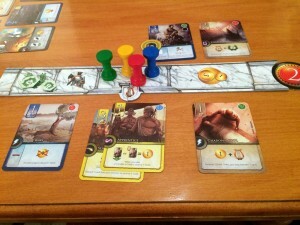 Each transfer allows a player to move one card from their Domain to the their Elysium although it also costs 1 to 3 gold (equal to the number of the card). When a card is transferred the player chooses which set it will go into (called Legends) or if it will start a new Legend (and they can not be re-allocated later). If a player was unable to gain a turn order marker (due to not having the colours required), not only will they go last but they also only get 1 gold and 1 transfer (which is very limiting). 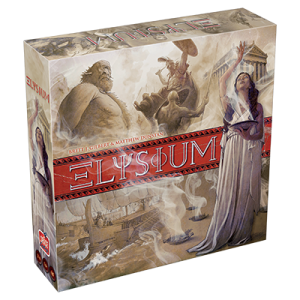 As well as points for sets of cards in Elysium at game end, there are other ways to gain VPs during the game, plus VPs for being the first to gaining complete sets as well as having the largest sets, and some cards’ powers give extra VPs based on various criteria. Elysium has plenty to think about. You need to gain cards that will make sets, gain cards that have good powers which combine well together, gain money to pay for transfers, gain transfers to move cards, deny cards from others, plus you need to consider which colour columns you will need and which to discard each round to ensure you get the cards you want. The mixture of card powers is really interesting and it’s interesting to find ones that combines well and/or match what you’re trying to achieve. I found there is a real feeling of tension throughout the game – not only from gaining cards (you want to grab certain cards before others, as well as get a turn order marker too), but also from trying to balance when to move your cards to Elysium (you want to keep using card’s abilities but have to transfer them to Elysium throughout the game because chances to transfer are limited). Also, having the right resources (cash and transfers) is critical too or you can’t transfer what you want. So, I constantly feel I’m only just balancing the various elements which is good as it means I feel it’s challenging but not impossible. Sets of cards are vital to your end game scoring, but it’s hard not to get distracted by gaining cards for their powers. It took me a while to realise that the powers are often relatively minor on their own but can be essential to give you the extra money, transfers, VPs, cards, etc. So, it’s important to balance a card’s power against the card’s potential contribution towards making a set – if it helps you with both then that’s great,but you’ll often have to choose which is more important. The game plays quite quickly – just ensure players don’t get bogged down in analysis paralysis when selecting a card or discarding a column. I actually think I preferred it slightly more with fewer players as there was more scope to include what your opponent was doing. Also, with fewer players, there’s more control over your card selections as less happens between your turns. With 2 players, there are slightly different turn order markers, but I was surprised that fewer god cards weren’t used too as it makes collecting sets of cards a bit more affected by the randomness of which cards are drawn. (Out of 105 cards in the god deck, only 35 get drawn in a 2-player game versus 65 in a 4-player game.) Still, it’s the same for both players. However, there is one element of the game that I’m not sure is actually necessary and that’s the coloured columns. The game mechanic is a nice idea but I feel it complicates the gameplay more than it adds to it. You can spend ages thinking about the coloured columns required, and which to discard; however, you usually end up with 1 or 2 items you wanted and then the best of what was left. I think a simpler system to achieve this (I had a couple of ideas for this) would give a similar effect, but allow me to focus more on the heart of the game which is the combining cards/abilities and transferring cards to Elysium. It’s not really a negative – just something I think could have been better. The other elements of the game are very interesting so override any this. Overall, I enjoyed Elysium and found it a tense and interesting challenge. There’re plenty of interesting decisions to be made, multiple elements which are tricky to balance, and resources always seem tight so you’re constantly trying to make the best of what you’ve got. 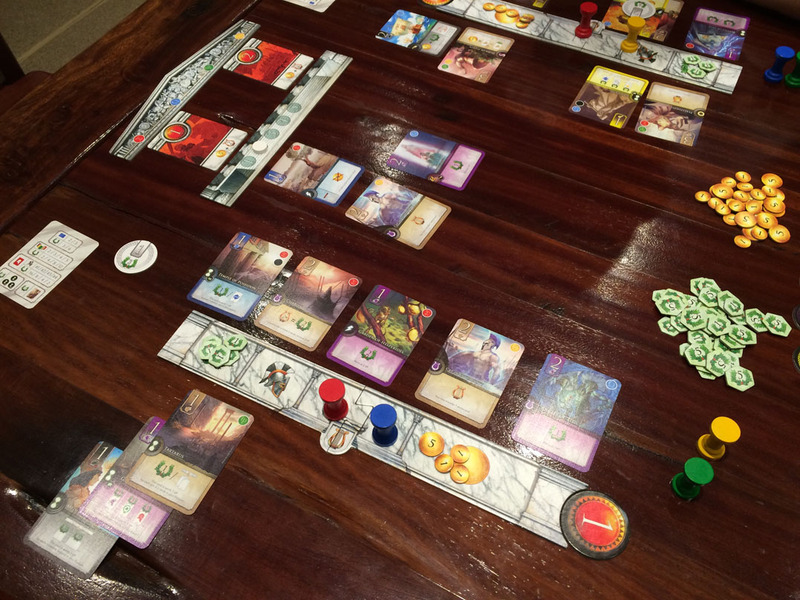 Also, I liked that even turn order is not a simple selection as going earlier in the round usually comes with fewer gold, VPs and transfers – so even that can be a difficult decision. The game looks really nice and 8 separate artists have each created the artwork for each of the sets of god cards, including the artist from Splendor. This entry was posted on Tuesday, May 5th, 2015 at 12:40 am	and is filed under Board Game Review, Board Games, Elysium. You can follow any responses to this entry through the RSS 2.0 feed. You can leave a response, or trackback from your own site. Good point. Too much writing essays and not enough sleep. Thanks for catching that. I’ve updated it.